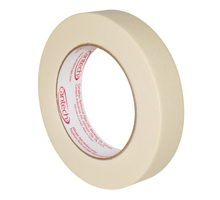 Ideal general purpose tape made from impregnated crepe paper designed to withstand temperatures up to 80°c. Highly adaptable it is suitable for a large range of applications including spray and brush painting, light bundling, packaging, shelf identification, protection and spicing. Being low tack, it is easily removable and leaves no residue along with minimum paint bleeding. Tape tears easily for convenient handling.